From now on , I get about 2 weeks in between the super-long runs. And good thing, that works into my "life" schedule better. 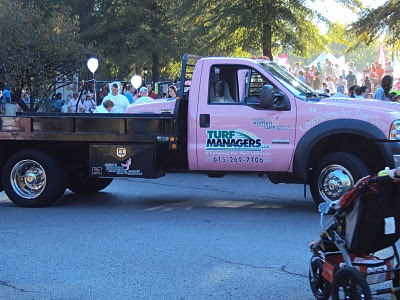 This past Saturday was my city's Komen 5k. This has always been my favorite event. This year was my 6th race in 8 years. I'm pretty proud of that! It is such a well-sponsored, well-organized (well, mostly, depending on what city you're in. Dallas is hard to beat, but it is where this foundation is based) event. There's pink everywhere! The breast cancer survivors are wearing pink race numbers so they're easy to spot. 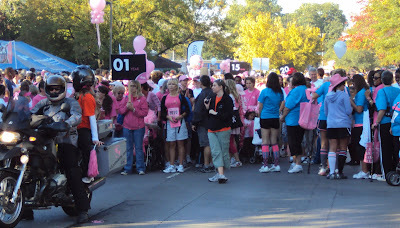 They have a parade of all the survivors according to how many years out they are before the race. And about every 1/2 mile along the way, there's TONS of people cheering and holding up signs. Lots of the signs and t-shirts people make say things like, "Save the TaTa's" and this....right at the beginning, there was 3 big, athletic looking guys holding up bright pink signs with black letters. Since I didn't get a picture of it, here's my extrememly artistic recreation of one of them. It made me laugh out loud! It's very empowering, in a way, if you're a woman. I spent most of the morning choked up! Good thing I have my sunglasses. Anytime I do a 5k, my goal is always to finish in under 30 minutes. 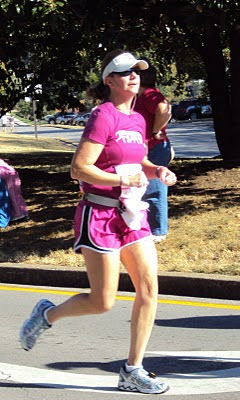 I only accomplished that for the first time last year at the Komen race and once since then. Last year my time was 28:48. This year I did a 5k on July 4th and my time was 29:27. This year, my husband and I both think my body is more set in a slower overall pace in order to cover the distances I am covering. I didn't stop at all until about 27 minutes, and I knew then I wasn't going to beat my time from last year, so I walked for a few seconds to catch my breath. My time wound up being 29:49. Finished under 30, but BARELY! Next week, I have my 2 short runs and then 12 miles, yes that's TWELVE, on Saturday. That's almost a half marathon right there. Oh yeah, and it's my birthday then too. So....maybe I'll do my mileage on Sun? Hmmmm, but will I really want to wake up early and do 12 miles after drowning myself in Deluxe Chicken Enchiladas and strawberry margaritas at Chuys? Prob not.